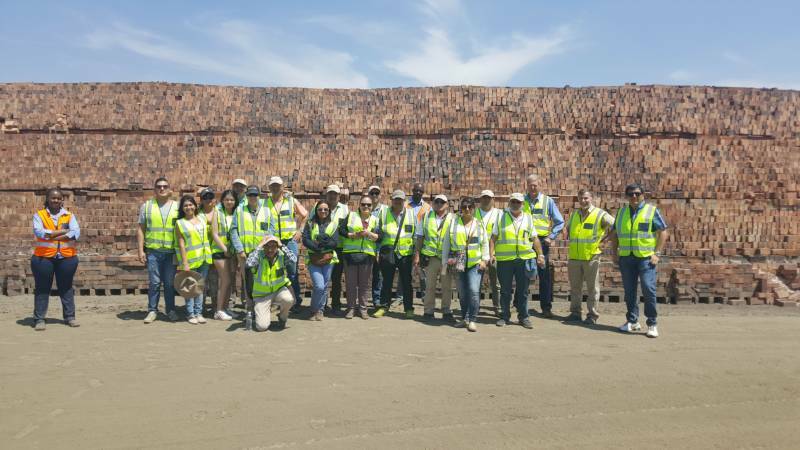 The mission began in Port Elizabeth and ended in Pretoria, where the Colombian delegation was able to visit Algoa Brick, Rheebok Brick, Worcester Brick, Apollo Brick and Rosema Brick. They meet with the Clay Brick Association, and the Technical Committee and were informed on some of the activities and projects that the clay brick sector is currently carrying out. Overall the brick makers were impressed by the innovation taken by the SA brick makers and in particular the Recirculation Vertical Shaft Brick Kiln (RVSBK) and the Habla Zig Zag Kiln (HZZK) technologies which would be ideally suited for Colombia based on the fuel type they use. They will continue to communicate with both the HZZK and VSBK service providers and look into the possibility of incorporating these technologies at their plants. One other thing they learnt from the South African brick makers is the method of incorporating internal fuel in bricks, this is something that they will be investigating upon their return. The Colombian ambassador, her Excellency Maria Eugena Correa Olarte, met with the delegation at Rosema Brick. She informed the delegation of the opportunities that exist between South Africa and Colombia and she would be happy to provide support for them going forward on future collaborations. The delegation appreciated the opportunity to see first-hand how some of the innovative activities and technologies, implemented by the brick makers, had helped improve production and reduce wastage. They especially appreciated the warm South African hospitality they received at all the factories they visited. Thank you in particular to the participating brick makers for being a part of the presentation and allowing the Colombian brick makers access to your plants and initiatives. This mission would not have been successful without your graciousness.